Crookwath Cottage is a beautiful stone cottage, full of character and old world charm with original details such as the Open range, salt cupboard, beams and stunning views from all windows, in the tiny hamlet of Dockray, in the heart of the English Lake District. The house has 3 first floor bedrooms sleeping 6 in total, two bathrooms, two large ground floor rooms large kitchen/dining. Bookings/enquiries can be made by telephone, and e-mail. An access statement is available and can be downloaded from the website or e-mailed on request. A scale plan of the cottage showing room layouts and sizes is shown on our web site, location of any steps and door widths is available. Any other specific questions about dimensions or location of facilities, please contact us. Public transport: Penrith 9 miles away. There are buses between Penrith and Troutbeck every hour and the bus stop is approximately 3 miles from the cottage. We can collect guests from Troutbeck by arrangement and provide timetables and information on taxi services on request. Nearest Shop, Post-office are in Glenridding, 4 miles away. Glenridding, has a wide range of local shops, a couple of hotels open to non-residents, several cafes, the pier for the 'Ullswater Steamers' ,an excellent Tourist Information Bureau and the local doctor's surgery. Nearest pub is in Dockray village 15 mins walk or 5 mins in car. We can help organize fishing trips, horse riding, climbing tuition, restaurant bookings and even a dinner-party service with cordon bleu chef during their stay with us. Access to the house from the A5091 is from a tarmac road and Crookwath Cottage is the first turning on the right as you approach the bottom of the hill which ends in a cul de sac. There are two car parking spaces on a level area outside the cottage on gravel, an additional car can be parked on the road on gravel edge. Cars parked in the drive will need to exit by reversing out of the property. The cottage has an outside light by the front door which is on a timer and comes on automatically. From the gravel parking area at the side of the cottage, the front door is down 3 sandstone steps. There is a wooden handrail to assist to a push down handle on the front door. Over the winter months you need to be aware that Crookwath can experience snow at any time from December to March and the cottage is at 1200 feet – so we can experience mountain weather. Depending on the amount of snow, we either have to park cars at the top of the hill which means a 5 minute walk back to the cottage or if there is a lot of snow forecast, then we park in the hotel car park which is 15 – 20 minutes walk away. Starting a walk back from the hotel bar with its roaring fire is no real hardship for the fit and able! However if you have very young, old or infirm people in your party, then maybe Crookwath is not for you at this time of year. Having said all this, we are here to help you and can provide sleds to help take your luggage down to Crookwath and advise about the weather and what to do about car parking. If you would like to chat about this, then do speak to Richard or Gina. 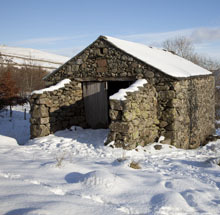 On a positive note – we live here and manage to exist happily throughout the winter months! The main entrance door (77cm wide) leads into the porch area with wall to wall coir matting and houses the boiler and dryer and hanging hooks for coats. The inner door ( 76cm wide) from the porch area has a round handle door knob and opens into an original farm house kitchen dining area with beams and Aga and views of Birkett Fell and the Dodds. The kitchen floor is lino tile effect and the sitting room has a light brown wool carpet. There are no steps between any of the rooms on the ground floor. The house is heated via oil fired central heating to radiators. The hot water comes from the Aga’s back boiler. There is a Squirrel wood burner in the sitting room. The house has wifi broadband and a reasonable vodofone signal. All rooms are well lit with a choice of lighting sources in most rooms. All rooms have a good supply of electrical sockets at an approximate height of 250mm from the floor. All internal doors in the cottage are single leaf, with traditional cottage latches at a height of 1200mm. The staircase rises from the back of the sitting room and consist of a straight flight of 11 shallow risers (step height 160mm and depth 250mm) before reaching a landing and a handrail on both sides. The first floor landing and all bedrooms are all fitted carpets. All windows have curtains and are double glazed throughout and in some cases quad glazed. Dining room is part of the kitchen area. It’s a large room and there is also a sofa area to watch the cook in operation without getting the way. There is a solid pine refectory table with 6 chairs. There are 3 sets of crockery to ring in the changes. Lighting is via a table light or standard lamp as well as overhead spot lights . The living room is beyond the kitchen and has a two-seater and a 3-seater sofa. There are 2 grandfather high wing backed chairs and a couple of single soft seats. There is Sky TV. Ipod player, and radio. There are three table lights, 2 central 60W ceiling lights, 2 over head spot lights and 3 floor lamps. There is a washer in the kitchen and a dryer in the porch as well as a traditional drying clothes horse over the Aga. All bedrooms are on the first floor and are fully carpeted. All walls on the first floor are painted in traditional paints in pale pastel colours of blues and creams or white. The master bedroom has a king size double bed. 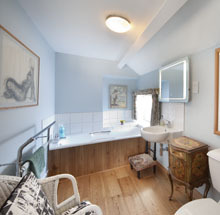 This room has a full-length mirror two double windows with views up the valley to the Dodds and it has an en-suite bathroom, basin and toilet with real oak flooring. There are built in cupboards and cot. The second double has a queen size double bed. And it is next door to the family bathroom, and 2 double windows with views to Watermillock. 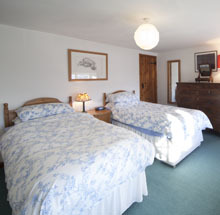 The twin room (can also be made into a double king size). This room has a full-length mirror. All bedrooms have top quality duck down pillows and duvets with 100% cotton/linen covers and there are also man- made fiber pillows available for people with allergies. No smoking is allowed anywhere within the property. There is a heated rail beside the basin, hooks on the back of the door, a glass shelf. There is a solid pine floor. The bath has individual single twist cross heads for hot and cold. Lighting is via four recessed downlighters. There is also an extractor fan on a timer. The kitchen is accessed either from the porch entrance or from the living room (77 cm wide) through an opening 76cm wide with no door. All work surfaces are 91 cm high with melamine tops. There is a double sink: with swan neck spout and single twist cross-head taps. The electric cooker has a single fan oven and a warming oven. There is a 4 ring ceramic hob with an extractor above it with lighting. Overhead and base unit cupboards are all made of oak with hand- made brass openers. The overhead cupboards house the crockery and glassware. All cookware and pans are in base-unit cupboards. The kitchen has five downlighter spotlight pods; under cupboard lights for the work surfaces. There is a fridge-freezer. There are three freezer drawers at its base with a fridge above. The height of the bottom and top shelves of the fridge from the floor are 83cm and 160cm. There is a fire blanket and fire extinguisher by the Aga and another fire-extinguisher stands on the work surface next to the sink near the door leading into the sitting room. The Aga is oil fired and produces all your hot water from a back boiler. It has two hobs hot and warm on the top and two ovens, hot and warm. The Aga is always on and ready to use for cooking. There is a circular picnic table and folding chairs are available. The rear woodland garden is accessed up two stone steps from the gravelled drive, there is a small stream running down one side and on past the cottage. Updating information about the area and what’s on offer annually.